Hailing from Florence, Italy, Adelmo Banchetti started his career in the food and beverage world at the tender age of 16. His work took him all over the world from ships to hotels, and finally, Dallas, Texas , where he worked at the legendary Fairmont Hotel's Pyramid Room, the Mansion On Turtle Creek, and the Crescent Court Hotel. 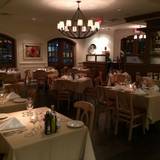 In 1989, he and his wife Eliza, who hails from the Mediterranean region, opened Adelmo's Ristorante to rave reviews. Their love of family, friends, good food and wines is reflected, to this day, at Adelmo’s. We feature cuisine inspired by the Italian/ Mediterranean region as well as the herbs, spices and grains indigenous to its shores. Made with the freshest ingredients. Now, the tradition continues with their children Andrew and Lauren on board . We continue to be family owned and operated and offer award winning wine selections and personalized service, all in a rare old world setting. Please fill in your information below and Eliza Banchetti will contact you as soon as possible to book your event. If you’d prefer to talk now, please call us at (844) 359-9250.